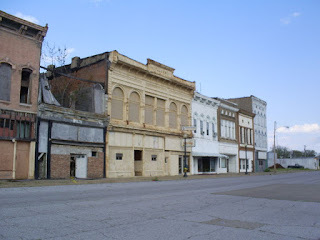 Neil Gaiman mentioned Cairo, IL in his blog the other day. Cairo figures into his book American Gods. The town is essentially dying, or perhaps is already dead, of a long slow decline that started generations ago. I've been to Cairo. You might even remember that I wrote about its unique pronunciation a few years back. I had grown up hearing it pronounced Kay-ro like the syrup. From what I can gather on the interwebs, us northern Illinoisans give it the harsher "Kay" sound while locals tend to soften it into more of a "Care". In any case, it is not pronounced like the city in Egypt. Gaiman even remarks upon the pronunciation in American Gods. About 15 years ago I made my 2nd (and to-date last) pilgrimage to Memphis and Graceland. (A trip that was mostly made to visit a college friend who lived in Memphis at the time.) On my way, I stopped in Cairo. My intention was to eat lunch there. After driving around what I presumed to be the main drag for a while and finding nary an open business let alone a purveyor of lunch snacks, I went back to the freeway and continued my journey. It was a ghost-town then. I can only imagine it today. Although, had I stopped there today I could have gone to the Ace of Cups, a cafe started by some self-described punk artists trying to help revive the city (8 Months in Cairo). Although they are now trying to sell the place. I don't know why, but I have a soft spot for Cairo. Perhaps its the quaintness of its pronunciation. I'm not sure, but that's why I stopped there so many years ago. It's interesting to think that Gaiman seems to have a soft spot for it as well. It has so much potential. You have the city of Cairo just up river from the city of Memphis, just like in ancient Egypt. It's at the confluence of the Mississippi and Ohio Rivers. The merging of two such important bodies of water should mean something, right? Apparently not enough. From what I gather Cairo's decline started not too long after it was founded. (What the Hell Happened to Cairo) Originally touted as a New Orleans of the North, gambling and prostitution were banned in the late 1800s. River traffic decreased. Then massive civil rights strife ripped the town apart in the 60s and 70s. Do I hope Cairo survives and is reborn? I'm not sure. The ancient city of Memphis in Egypt died and disappeared into ruins. Maybe the it's somehow divine symmetry that Cairo should suffer the same fate.